Great evening. Good Turn out. Quilters have their designs chosen, colours selected, and a joint fabric order for both quilts. The painting teams are getting signed up. First come; first serve to adopt five quilt blocks each, set up a workshop, and have a weekend painting party. Delaware Lions. Tait’s Corner Community. Upper Thames Military Re-enactment Society are in. The painting schedule starts in the New Year. We hope that whoever hosts a painting venue will be able to offer it to more than one group. Call Denise Corneil at 519 693-7002. Sponsors are being sought. 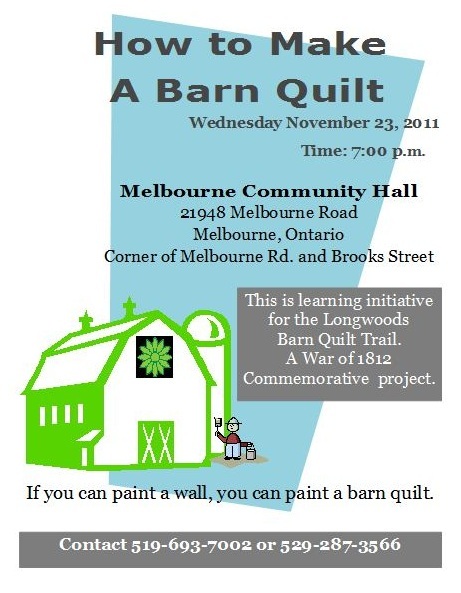 Posted on November 23, 2011, in Barn Quilt Champions., Establishing a barn quilt trail, Tips & Techniques. and tagged barn quilts, Delaware, Learn, Longwoods Barn Quilt Trail, Longwoods Road, Thamesville, War of 1812. Bookmark the permalink. 1 Comment.